In a previous post I shared with you problem #1 of period shame. Did you miss it? Catch up here. So many of us learned to be embarrassed or ashamed of our periods, whether we were aware of those messages or not. Not only is this shame psychologically damaging to our sacred Goddess spirit, but it can prevent us from tuning into and understanding our fundamental health as women. If you hate your period you’re not likely to turn to it for clues about the physical challenges you might be experiencing. Did you know that the colour of your period blood, whether it’s a heavy or light flow, how many days of flow you get, the presence of blood clots—all tell you how healthy or not you are? Before you even get a doctor’s diagnosis of PCOS, fibroids, endometriosis, amenorrhea OR infertility, your period has been sending you messages that you probably never understood. This is the second problem of period shame—it cuts you off from the messages your body is trying to send you, which would save you a lot of pain if you only knew how to listen. What’s worse, period shame is capitalized upon by companies who tell us we need to douche away our vaginas’ natural odors. So not only do we not know how to interpret our period clues, we’re told we need to clean up “down there” because there’s something unacceptable with our va-jay-jay’s just the way they are! The consequence of all this disconnection and inherited shame is that we aren’t relating with our wombs. According to Miranda Gray, our female soul lives in our womb centre. Imagine how sad your womb must feel if the dominant cultural opinion about periods is that they’re gross, they smell bad, and they should be covered up or shut up altogether with menstrual suppression like the pill. Instead of opening to your body wisdom, the medical model shuts you off from your female intuition. The pill is a bandaid given to so many young women—and it can quickly turn into a very expensive bandaid when the underlying health issue isn’t dealt with and infertility results. 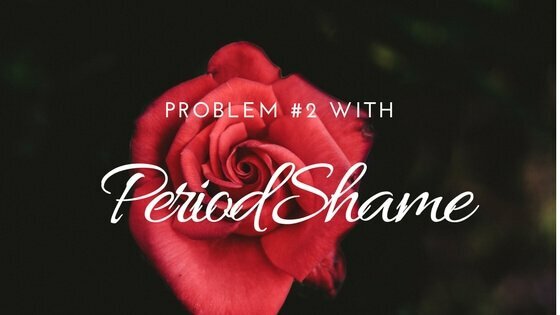 In the next post I’ll share with you Problem #3 of period shame, which is all about the cultural stigma that our cycles make us emotionally haywire — think pms. And you don’t want to miss that one, because we’re going to move beyond problems to solutions, and I’ll show you how you can start feeling in sync with your hormones, your period, and your innate emotions—naturally. Curious how you can foster a healthier connection to your menstrual cycle now? Click here to access my unique moon meditations, which help you tune into the four distinct energies of your cycle to maximize your Goddess energy all month long!